Jian Jing (Shoulder Well) is a place many people tend to store their stress. Every day, people come into my office and complain about neck and “shoulder tension.” They really mean the trapezius and levator scapula muscles, not the shoulder joint. I’ve been saying for years that we need a better name for this part of the body, but “noulder” isn’t catching on (for obvious reasons!). Referred pain and trigger points for the trapezius. 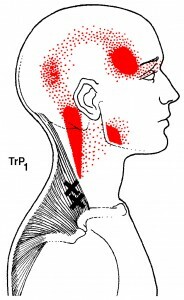 The trapezius is a big muscle, and it does a lot. Carrying heavy loads (especially unbalanced ones – so carry a small purse and use both straps of your backback! ), working with your arms up (I’m talking to you, hair stylists! ), or just general hunchiness over a computer… all are common causes of tension. The traps refer pain over the head to the eyebrow area, so shoulder tension can give you a severe frontal headache. GB-21 also descends energy, so it’s good for rebellious rising Qi causing headaches, dizziness, heartburn, or vomiting. GB-21 for relieving neck and shoulder tension. Find GB-21 at the top of the upper thoracic area (aka “noulder”), halfway between the shoulder joint and the spine. Press firmly for 10-15 seconds with a healing intention. NOTE: Do not use GB-21 on pregnant women. Also – look into some better ways to release your stress! This entry was posted in Acupressure YOU can do, Muscle & Joint and tagged acupuncture, headache, neck, pain, pain management, pregnancy, shoulder, tension by Sharon Rose. Bookmark the permalink.